You can do your own here. Tip of the TinFoil to Brad Drell. LATER: It looks like it’s a lonely quandrant. Wonder what would happen if they measured writers and artists and musicians instead of politicians and political leaders for their scores? Perhaps we might find more company? Take yours and bring the mark up to the exact same place in the blue quadrant and that’s where I came out. Some of the questions were skewed, I think. And even tho’ I’ll be turning fifty next year I’m still not sure about national and global economic questions. Don’t know exactly what I believe in that regard. Economic Left/Right: 5.75Social Libertarian/Authoritarian: 2.62Not sure what this really says about me, but interesting. I’m in here, too. At least the first time I took it. I got 3.00/-0.15. I wanted to review some of the earlier questions, so took it a second time and got 2.00/0.62.I, too, felt some of the questions were not worded percisely enough and felt torn between agree and disagree. Like no doubt SOME multi-companies are abusing the environment, but just as certainly, not all are. So what should I put? agree or disagree? What a dilemma! I think it’s interesting that the reasserters are clustered. Also that none of us seem to be extremists.I suspected the latter, but am bemused by the former. I share your quadrant, too, bb. 4.25 and -0.77 I thought a number of the questions were clearly skewed and were difficult to answer with clarity. But I tried to figure out the intent of the question and place myself accordingly. Anglican “dialoguing” gives one practice at that sort of thing. Great find BB. I scored 3.5/-1.85 respectively so you’re in good company. 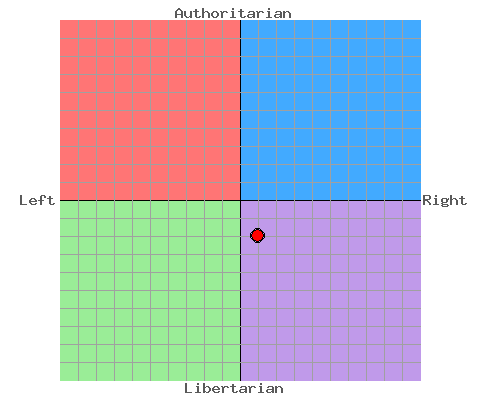 Economic Left/Right 2.00Social Libertarian/Authoritarian 2.67Wow. I’m really surprised–I’ve always considered myself fairly conservative, especially on economics. I’m also in the Lonely Quadrant with you, BB. I’m far more right economics wise; similar socially.Those in the quadrant include Ayn Rand and Milton Friedman.I wonder if there’s not another important dimension that would show us more separate. There were a lot of sexuality questions which I presume are meant to differentiate socially in the test.